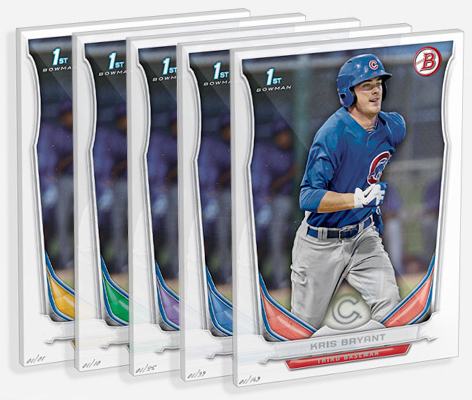 With his MLB debut in the books, collectors can expect a lot of Kris Bryant cards this year. Topps has already announced their early plans for the first Kris Bryant rookie cards. And it's not like there is a shortage of stuff from the years before his first game with the Cubs. His 2014 Bowman Baseball Prospect card is getting recreated as an online-exclusive. 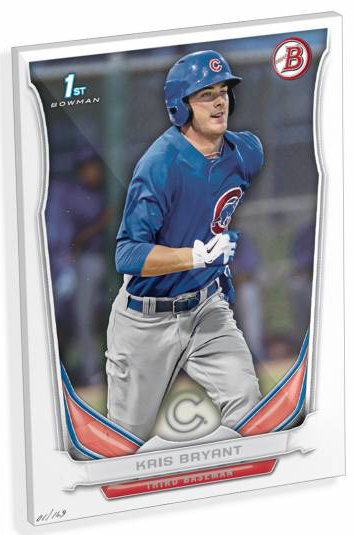 The 2015 Topps Kris Bryant 2014 Bowman Acrylic Wall Art is an over-sized version of the phenom's first base Bowman card. Although the most expensive, the Green and Gold versions sold out almost immediately. Each of the 2015 Topps Kris Bryant 2014 Bowman Acrylic Wall Art pieces measure 10x14". They also include a mount for hanging on the wall. With the acrylic material, the end result is similar to a thick acetate card. I picked this up a Blue version new in the box w/ mounting hardware (#1/99) on the secondary market for about $63 bucks shipped, and I have to say that it is looking mighty SHARP hanging on my wall. The blue trim on the front matches his jersey and makes it look awesome! I was thinking about taking it to PNC Park when the Cubbies were in town earlier this summer, but I don’t know how easy it would be to sneak that big acrylic square into the ball field so I might just wait until later on to try to get it signed. I think it would look great with a big huge auto right in the middle. These things are very cool I never even saw them when they were new, if I had maybe I would have bought a rarer version, but I’m very happy with the one I did get. If you like Kris Bryant or the Cubs and have a spot on the wall for a very cool conversation piece, then you’d love it. I’m going to look around for some more of these things, because I can think of quite a few iconic cards that I have in my collection that are much too small to display on the wall, this is a whole new way to pay homage to the best cards made and its a great idea, something different.